Your windows and glass surfaces can sparkle and shine with the right cleaner. By keeping your windows and mirrors clean, they can perform optimally, allowing you to see clearly. What Is Glass and Window Cleaner? Glass cleaner is formulated to cut through dirt, grease, grime, and smudges on windows and glass surfaces. If you’re looking for a streak-free shine, take a look at the top glass and window cleaners below. 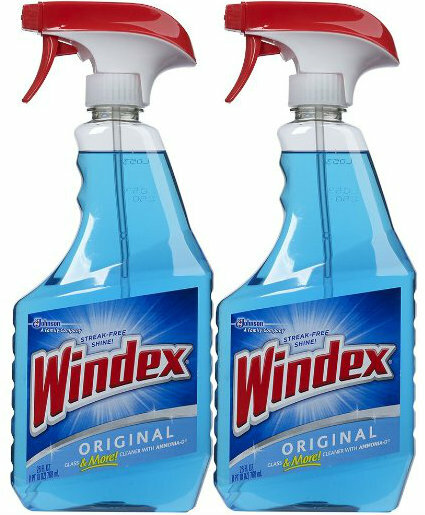 Amazon’s #1 best-seller in glass cleaner, Windex Cleaners just can’t be beat. There’s a reason it’s a household name. It can help you achieve a streak-free shine on all indoor and outdoor glass surfaces, including windows, shower doors, mirrors, stove tops, and more. It can cut through grime, soil, and smudges without a strong ammonia scent. This versatile two-pack features an angled tube design, allowing you to get more cleaner out of every bottle. Windex claims to be “America’s #1 glass cleaner” and is recommended by AOL and About.com. If you prefer a foam application, consider the Windex Foaming Glass and Surface Cleaner. If you prefer wipes, consider the Windex Flat Pack Wipes, which are also recommended by About.com. The Windex Outdoor Glass & Patio Cleaner is also commonly recommended for your outdoor needs. Sprayway Ammonia Free Glass Cleaner is a foaming cleaner that you can use on windows, mirrors, windshields, and other glass and plastic surfaces. The effective cleaner achieves heavy-duty cleaning action without ammonia. The foam clings and dries to leave a streak-free shine with no film. The four-pack of cleaner leaves behind a clean, fresh fragrance that most reviewers tend to like. It is recommended by NY Times and AOL, and has outstanding online reviews, including nearly 500 five-star reviews on Amazon. 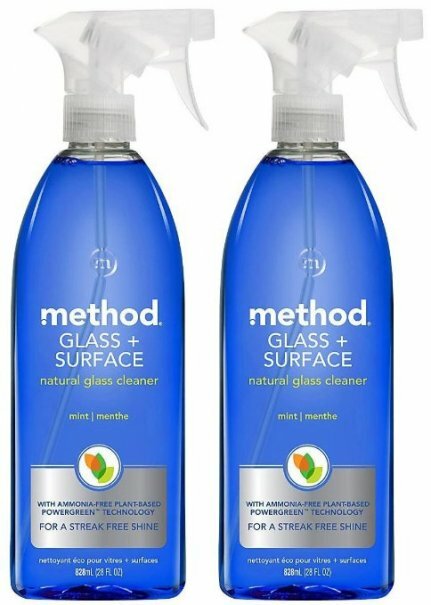 If you’re looking for a good natural, non-toxic cleaner, the Method Natural Glass + Surface Cleaneris right for you. It can quickly, effortlessly remove dirt, dust, fingerprints, and smudges from windows, mirrors, and any glass surface. The green alternative uses ammonia-free plant-based powergreen technology for a streak-free shine. This two-pack of effective cleaners is less harmful and has a fresh minty scent that most reviewers tend to love. It is recommended by AOL, About.com, and GoodGuide, and has outstanding online reviews. Good Housekeeping found that it works well on glass, but can take longer to cut through grease. The professional tint-safe Invisible Glass Premium Glass Cleaner can be used on glass, windows, mirrors, chrome, and even on car windows and the inside of a car windshield. The ClearDry formula removes oils, dust, dirt, grease, smudges, fingerprints, grime, and more in no time. It leaves a streak-free, haze-free shine with no film or residue. The multi-component formula is more powerful than most glass cleaners and contains no soaps, foams, scents, or dyes. The light scent fades, so you won’t be left with a strong odor. It is recommended by NY Times and has outstanding online reviews, including more than 500 five-star reviews on Amazon. It is also backed by a money-back guarantee. If you prefer an aerosol spray can, consider the Invisible Glass Premium Glass Cleaner. Glass Plus Glass Cleaner Trigger works on indoor and outdoor surfaces, like glass, mirrors, stove tops, and stainless steel and granite surfaces. The multi-surface cleaner cuts through dirt, grease, and grime to leave a streak-free shine in no time. This affordable trigger spray cleaner is recommended by AOL and About.com, and has outstanding online reviews. And those are our recommendations for the best glass and window cleaners. Be sure to call The Window Source of Des Moines for all of your replacement window and door needs! For more articles click here!